1982 - PhD thesis entitled: 'Reactions of Phenylmethylene with Imines' (supervisor: Prof. Romuald Bartnik) (University of Łódź). 1991 - Habilitation 'Thioketones and their S-Methylides' (University of Łódź). Organic synthesis, reaction mechanisms, heterocyclic and heteroatom chemistry, the organic chemistry of sulfur, 1,3-dipolar cycloadditions, hetero-Diels-Alder chemistry, heterocyclic N-oxides, the organic chemistry of fluorine, congested systems, heterocumulenes, flash vacuum pyrolysis, carbenes (including nucleophilic carbenes NHC) and nitrenes . 1983-1985; 1987-1988 - University of Munich (Germany); Alexander von Humboldt Fellow in the research group of Prof. Rolf Huisgen. 1995 - University of Zurich (Switzerland); Swiss Government Fellow in the research group of Prof. Heinz Heimgartner (3 monthes). 1996-1997 - University of Southern California (USA); Distinguished Scholar at Loker Hydrocarbon Institute; research group of Nobel Prize Laureate 1994, Prof. George A. Olah. 2004 - Free University Berlin (Germany) -Visiting Professor, Humboldt Fellow in the research group of Prof. H. U. Reissig. 1987-2008 - Justus Liebig University (Giessen, Germany) - Visiting professor in the research groups of Prof. Prof. G. Maier and subsequently prof. P. R. Schreiner. Dean of the Faculty of Chemistry, University of Łódź (2012-2016). Vice Dean of the Faculty of Mathematic, Physics & Chemistry (University of Łódź) - (1993-1996). Member of 'Senat' of the University of Łódź (2012-2016). Member of the Editorial Boards of Sulfur Letters and Sulfur Reports(until 2004; at currently under new tile: Journal of Sulfur Chemistry) and Phosphorus, Sulfur, and Phosphorus Sulfur Silicon Rel. Element. Prof. H. Heimgartner, University of Zurich (Switzerland), Prof. W. Weigand, University of Jena (Germany), Prof. P. R. Schreiner (University of Giessen (Germany), Prof. M. Gulea University of Caen (France). Over 300 original papers, 36 review articles, 6 patents, > 400 symposia presentations, > 50 invited lectures. Copernicus Award for Glorious Study Primus Inter Pares (1974), Gold Cross for Service (1998), Award In Service of Science and the Society (1999), Award of the Commission of National Education (2004), Prizes the Polish Ministry of Science and Higher Education for Outstanding Scientific Achievements of (1999, 2003, 2007, 2011), 'Liebig Lectureship' by German Chemical Society (2012), S. Kostanecki Medal by the Polish Chemical Society (2013), 'Antoni Basinski Lecturship' (Nicolaus Copernicus University, Torun, 2017), J. Śniadecki Medal by the Polish Chemical Society (2018). Married, spouse: Jadwiga Filarska-Mlostoń. Children: Anna (1978), Ewa (1980), Katarzyna (1994). Gardening, travelling, classic music, fine arts. New Selenocarbazides Derived from Imidazole-Based Carbohydrazides. Helv. Chim. Acta, 2013, 96, 397-407. Unexpected Reaction Course, of 3-Amino-5-arylopyrazoles with Dialkyl Dicyanfumarates. Helv. Chim. Acta, 2013, 96, 633-643. Enantioselective additions of (trifluoromethyl)trimethylsilane to α-iminoketones derived from arylglyoxals. Tetrahedron Lett., 2013, 54, 2462-2465. A new approachto α-(trifluoromethyl)benzyl substituted oxaziridines. J. Fluorine Chem., 2013, 151, 7-11. Synthesis and Evaluation of Antimicrobial Activity of 3-Oxido-1H-imidazole-4-carbohydrazides Hydrazones. Eur. J. Med. Chem., 2013, 64, 389-395. Towards New imidazole-2-thione-based organocatalysts; Sulfur transfer vs. deoxygenation in the reaction of imidazole N-oxides and cycloaliphatic thioketones. Phosphprus, Sulfur, and Silicon, 2013, 188, 469-472. Synthesis of New enantiopure thiourea derived from (S)-proline. Phosphprus, Sulfur, and Silicon, 2013, 188, 509-511. Synthesis of enantiopure bis-heterocycles derived from (S)-prolinehydrazide. Phosphprus, Sulfur, and Silicon, 2013, 188, 493-495. Rusian J. Org. Chem., 2013, 49, 1080-1082.,Zhurnal Organicheskoi Khimii 2013, 49, 1094-1096. Optically Active Imidazole N-Oxides Derived from L-Prolinamine. Tetrahedron: Asymmetry, 2013, 24, 958-965. (DOI: 10.1016/j.tetasy.2013.07.013). The first matrix isolation oft he methylsulfinyl radical CH3SO. Chem. Commun., 2013, 49, 9467-9469. (DOI: 10.1039/c3cc45379k). Nucleophilic trifluoromethylation of aziridinyl ketones; a convenient access to fluorinated aziridinyl alcohols. J. Fluorine Chem., 2013, 156, 192-197. Beilst. J. Org. Chem., 2013, 9, 2751-2761. Exploration of fluoral hydrazones derived from carbohydrazides for the synthesis of trifluoromethylated heterocycles. Heterocycles, 2014, 88, 387-401. (DOI: 10.3987/COM-13-S(S)40). Concerted versus Non-Concerted 1,3-Dipolar Cycloadditions of Azomethine Ylides with Electron-Deficient Dialkyl Dicyanobutenedioates. 1,3-Dipolar cycloadditions of fluorinated nitrones with thioketones. J. Fluorine Chem., 2014, 165, 27-32 (DOI:org/10.1016/j.jfluchem.2014.05.015). Reactions of Cycloaliphatic Thioketones and Their Oxo Analogues with Lithiated Methoxyallene: A New Approach to Vinylthiiranes. Chem Asian J., 2014, 9, 2641-2648 (DOI: 10.1002/asia.201402547). Chemoselective additions of (trifluoromethyl)trimethylsilane to C=N bonds of α-iminoketones derived from arylglyoxals. Hetaryl Thioketones: Synthesis and Selected Reactions. Reactions of diphenylketene with aromatic thioketones. 1,3-Dipolar cycloadditions of α-diazoketones derived from N-protected (S)-proline witth aromatic and cycloaliphatic thioketones. Gas-phase generation and matrix isolation of the methylsulfonyl radical CH3SO2. J. Phys. Chem., 2015, 119, 2211-2216 (DOI: org/10.1021/jp5036647). Lithium diisopropylamide (LDA) as an efficient reducing agent for thioketones - mechanistic consideration. Phosphorus, Sulfur, and Silicon, 2015, in press. Synthesis and (spectro)electrochemistry of mixed-valent differrocenyl-dihydrothiopyran derivatives. Selenopen-2-yl substituted thiocarbonyl ylides - at the boarderline of dipolar and diradical reactivity. A new approach to optically active bisheterocycles bearing the N-unsubstituted pyrolidine group. Studies on the reactions of thiocarbonyl S-methanides with hetaryl thioketones. On the strong difference in reactivity of acyclic and cyclic diazodiketones with thioketones: experimental results and quantum-chemical interpretation. G. Mlostoń, P. Grzelak, M. Mikina, A. Linden, H. Heimgartner, Hetro-Diels-Alder Reactions of aryl and hetaryl thioketones with acetylenic dipolarophiles. Reactions of methylsulfinyl radical (CH3(O)S) with oxygen (3O2) in solid argon. Reactions of (L)-prolinol with aryloglyoxals. Nucleophilic additions of (difluoromethyl)trimethylsilane to α-iminoketones and aryl diketones: a new route to the β-amino-α-(difluoromethyl) alcohols. Studies on the reaction of aryl glyoxals with L-prolinol: Unexpected formation of morpholin-2-one derivatives and stereoselective trifluoromethylation of the bicyclic system. Synthesis of optically active polyheterocycles containing pyrrolidine, imidazole, and 1,2,3-triazole rings. Tetrahedron; Asymmetry, 2015, 26, 1448-1452. 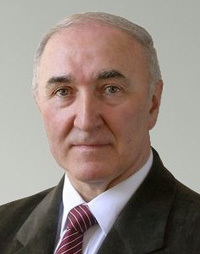 (http://.doi.org/10.1016/j.tetasy.2015.10.019). G. Mlostoń, R. Hamera, H. Heimgartner, Synthesis of ferrocenyl thioketones and their reactions with diphenyldiazomethane. New application of hetaryl thioketones for the synthesis of hetaryl-substituted ethenes via 'two-fold extrusion reaction'. An unexpected reaction of diethyl phosphite with electron-deficient dialkyl dicyanofumarates. Synthesis of hetaryl-substituted 1,2,4-trithiolanes via three-component reaction with dihetaryl thioketones, benzyl azide and 2,2,4,4-tetramethyl-3-thioxocyclobutanone. J. Sulfur Chem., 2016, 37, 14-22 (DOI:org/10.1080/17415993.2015.1082182). Efficient synthesis of trifluoro- and difluorohydrazides as useful building blocks for fluorinated 1,3,4-oxadiazoles. Chem. Heterocycl. Comp., 2016, 52, 133-139 (DOI: DOI 10.1007/s10593-016-1845-3). Diradical reaction mechanisms in [3+2]-cycloadditions of hetaryl thioketones with alkyl- or trimethylsilyl-substituted diazomethanes. Beilstein J. Org. Chem., 2016, 12, 716-724 (DOI: 10.3762/bjoc.12.71). Ferrocenyl Substituted 1,3-Dithiolanes via [3+2]-Cycloadditions of Thiocarbonyl S-Methanides with Ferrocenyl/Hetaryl Thioketones. Phosphorus, Sulfur, and Silicon, 2016, 191, 576-577. (DOI: 10.1080/10426507.2015.1128908). Synthesis and photophysical properties of novel donor-acceptor N-(pyridyn-2-yl) substituted benzo(thio)amides and their difluoroboranyl derivatives. Phys. Org. Chem. A, 2016, in press (DOI: 10.1021/acs.jpca.6b04004). Synthesis of ferrocenyl-substituted 1,3-dithionaes vis [3+2]-cycloadditions of ferrocenyl hetaryl thioketones with thiocarbonyl S-methanides. Synthesis of ferrocenyl- and hetaryl-substituted 2,2,2-trifluoroethanols and their conversion into 2,2,2-trifluoroethanethiols using Lawesson reagent. Synthesis of optically active trifluoromethyl-substituted 2,3-dihydroimidazo[2,1-b]oxazoles. First application of fluorinated nitrones for the syntehsis of fluoroalkyl β-lactams via Kinugasa. Strong influence of the trifluoromethyl group on the chemoselectivity of [3+2]-cycloadditions of thiocarbonyl S-methanides with α,β-unsarurated ketones. Stereoselective 1,3-dipolar cycloadditions of thioketones to carbohydrate-derived nitrones. Trifluoromethylated 2,3-dihydro-1,3,4-thiadiazoles via the regioselective (3+2)-cycloadditions of fluorinated nitrile imines with aryl, hetaryl, and ferrocenyl thioketones. [FeFe]-Hydrogenase H-Cluster Mimics with Unique Planar μ-(SCH2 )2 ER2 Linkers (E=Ge and Sn). Chem. Eur. J., 2016, 22, in press; (DOI: 10.1002/chem.201603843). Taming of Thioketones - The First Asymmetric Thio-Diels-Alder Reaction of Thioketones as a Convenient Entry to Optically Active Dihydro-2H-thiopyrans. Hetero-Diels-Alder reactions of hetaryl-thiochalcones with acetylenic dienophiles. Application of diethyl ethynephosphonate for the synthesis of 3-phosphonylated β-lactams via Kinugasa reaction. [3+2]-Cycloadditions of N-protected '(S)-diazoprolines' with selected acetylenes. Application of diethyl ethynephosphonate for the synthesis of 3-phosphonylated ?-lactams via Kinugasa reaction. Microwave assisted synthesis of ferrocenyl and hetaryl functionalized thioketones. Phosphorus, Sulfur, Silicon, Relat. Elem. 2017, 192, 197-198. ( DOI: org/10.1080/10426507.2016.1252367). Taming of thioketones - the first asymmetric thio-diels-alder reaction with thioketones as heterodienophiles. Chem. Eur. J., 2017, 23, 346?359 (DOI: 10.1002/chem.201603843). Dimerization reactions of diaryl- and dihetaryl-substituted thiocarbonyl S-methanides as diradical processes - a computational study. G. Mlostoń, P. Grzelak, G. Utecht, M. Jasiński. Efficient synthesis of fluoroalkylated 1,4,2-oxathiazoles via regioselective [3+2]-cycloaddition of fluorinated nitrile oxides with thioketones. Unexpected course of the attempted conversion of ferocenyl(hetaryl)methanols into thiols using Lawesson's reagent. Thia-Diels-Alder reactions of hetaryl thioketones with nonactivated 1,3-dienes leading to 3,6-dihydro-2H-pyrans: evidence for a diradical mechanism. M. K. Kowalski, E. Obijalska,, G. Mlostoń, H. Heimgartner. Generation and reactions of thiocarbonyl S-(2,2,2-trifluoroethanides). Synthesis of trifluoromethylated 1,3-dithiolanes, thiiranes and alkenes. Expected and unexpected results in reactions of fluorinated nitrile imines with (cyclo)aliphatic thioketones. A novel application of silylated 1,3-dithiolanes for the synthesis of aryl-, hetaryl-, and ferrocenyl substituted ethylenes. Beilstein J. Org. Chem., 2017, 13, 1900-1906. DOI:10.3762/bjoc.13.185. The unusual influence of hetaryl groups on the direct conversion of some secondary alcohols into thiols with Lawesson's reagent: elucidation of the reaction mechanism. J. Sulfur Chem., 2017, 38, 475-487 (DOI: 10.1080/17415993.2017.1313257). Generation and selected reactions of chlorinated thiocarbonyl S-imides. J. Sulfur Chem., 2017, 38, 530-547 (DOI.org/10.1080/17415993.2017.1325892). The first organocatalytic, ortho-regioselective inverse-electron-demand hetero-Diels-Alder reaction. Chem. Commun., 2017, 53, 11472-11475 (DOI: 10.1039/C7CC06518C). [3+2]-Cycloadditions of nitrile imines with hetaryl thioketones. Dialkyl dicyanofumarates as new oxidizing reagents for the converions of thiols into disulfides and selenols into diselenides. Chem. Heterocycl. Comp. 2017, 53, 1-1. R. Moran, A. Pröbstl, Recent developments of the chemistry of thiocarbonyl ylides (a review). Bull. Soc. Chim. Belg. 1984, 93, 511-532. New cycloadditions in organic sulfur chemistry. Lectures in Heterocycl. Chem., Suppl. of Heterocycl. Chem. 1987, 24S, 1-11. Fotolityczne generowanie reaktywnych ylidów tiokarbonylowych w matrycach niskotemperaturowych. Wiadomości Chem. 1995, 49, 773-776. J. Pure and Appl. Chem. 1996, 68, 789-798. Sulfur-Centered Reactive Intermediates; Thiocarbonyl Ylides - Precursors of Some Heterocyclic Compounds. Polish J. Appl. Chem., 1997, 41, 361-368. New Applications of Organic Azides in Syntheses of Sulfur- and Nitrogen-Containing Heterocycles. Chem. Papers (Bratislava), 1998, 52, 56-63. New Adventures with Thioketones and Related Compounds. Phosphorus, Sulfur and Silicon, 1999, 153-154, 217-234. Generation and Typical Reactions of Thiocarbonyl-Ylides (review). Polish J. Chem., 2000, 74, 1503-1533. Reakcje związków Siarko-Organicznych z Karbenami oraz Karbenoidami. Laboratoria, Aparatura Badania "Lab", 2000 (4), 14-17.
in Synthetic Applicarions of Dipolar Cycloaddition Chemistry Toward Hetrocycles and Natural Products, Ed. A. Padwa, J.Wiley & Sons, New York 2002 , Chapter 5, 315-360. "Nitrogen, Oxygen and Sulfur Ylide Chemistry - Series: Practical Approach in Organic Chemistry", ed. J. S. Clark, Oxford University Press 2002, Chapter 3.12, p. 271-277. Sulphur-Conatining Heterocycles from Reactions of Thiocarbonyl Compounds with Carbenes and Carbenoids. Speciality - Chemicals Magazine, 2003, 23, 38-40. Selected Cyclic Oligosulfides and Oligosulfide S-Oxides and their Reactions with Platinum(0) Complexes. Coordin. Chem. Rev., 2003, 245, 167-175. Electronic Encyclopedia of Reagents for Organic Synthesis, ed. L. A. Paquette, Article - RN 00429, Wiley & Sona, New York 2004. Electronic Encyclopedia of Reagents for Organic Synthesis, ed. L. A. Paquette, Article - RN 00430, Wiley and Sons, New York 2004. 1,3-Dipolar Cycloadditions - beyond Concertedness (review). Modern Problems of Organic Chemistry, 2004, 14, 23-45. Electronic Encyclopedia of Reagents for Organic Synthesis, ed. L. A. Paquette, Article - RN 00504, Wiley & Sons, New York 2005. Sci. Synth. 2005, 24, Section 24.2.14, 541-544. Synthesis of Sulfur-Heterocycles from aromatic Thioketones. Part I - Three and Four-Membered Rings. Targets in Heterocyclic Systems - Chemistry and Properties, Eds. O. A. Attanasi and D. Spinelli, Italian Society of Chemistry, Rome, 2005, 9, 141-157. Synthesis of Sulfur-Heterocycles from aromatic Thioketones. Part II - Five-, Six- and Seven-Membered Rings. Targets in Heterocyclic Systems - Chemistry and Properties, Eds. O. A. Attanasi and D. Spinelli, Italian Society of Chemistry, Rome, 2006, 10, 266-300. J. Fluorine Chem., 2010, 131, 830-844. Current Org. Chem, 2011, 15, 675-693. Matrix studies with sulfur heterocycles and related species. Phosphorus, Sulfur, Silicon, 2011, 186, 1175-1188. Electronic Encyclopedia of Reagents for Organic Synthesis, ed. L. A. Paquette, Article  DOI: 10.1002/047084289X.rn00150, Wiley & Sons, New York 2012. Sulfur Ylides - Thiocarbonyl Ylides (update 2014). Science of Synthesis, 2014, Vol. 27, Chapter 27.1.6.1, pp. 377-384. Sulfur Ylides - Sulfoxonium Ylides (update 2014). Science of Synthesis, 2014, Vol. 27, Chapter 27.1.6.2, pp. 385-392. Science of Synthesis, 2014, Vol. 27, Chapter 27.4.3.1, pp. 393-395. Science of Synthesis, 2014, Vol. 27, Chapter 27.4.3.2, pp. 395-401. Science of Synthesis, 2014, Vol. 27, Chapter 27.26 pp. 403-411. Sulfur Ylides - Sulfonium Ylides (update 2014). Science of Synthesis, 2015, Vol. 27, Chapter 27.1.7, pp. 401-424. Recent progress in the chemistry of 2-unsubstituted imidazole N-oxides. Curr. Org. Chem., 2016, 20, 1359-1369 (DOI: 10.2174/1385272820666151210000010). Phosphorus, Sulfur, and Silicon, 2016, in press, (DOI: org/10.1080/10426507.2016.1252368). Aryl, hetaryl, and ferrocenyl thioketones as versatile building blocks for exploration in the organic chemistry of sulfur. Phosphorus, Sulfur, Silicon, Relat. Elem. 2017, 192, 204-211 (DOI: org/10.1080/10426507.2016.1252368).